You've heard about the Washington, D.C.- area, contractor that got Mike Tyson to star in the company's Super Bowl 50 commercial. But have you heard about the guy shown knocked out by "Iron Mike"? Sam Crossed, aka the Vanilla Gorilla, is a professional boxer who trains at Old School Boxing Gym in Fort Washington, Maryland. 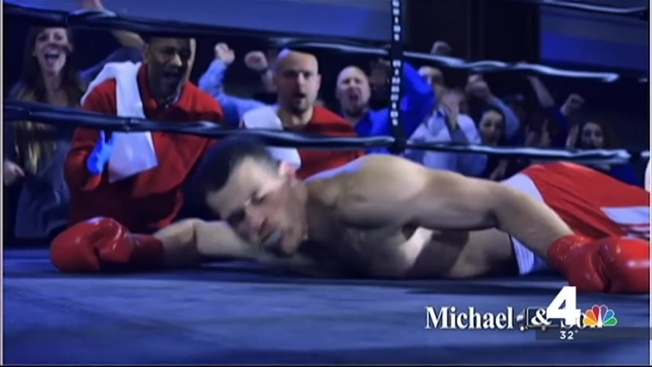 The 30-second ad for Michael & Son Services, which is a News4 advertiser, shows Crossed getting punched once by Tyson. But he actually was hit 10 times in the making of the ad that aired Sunday. It was a fake punch, but it still stung, he said. "It grazed my lip. He pulled up right at the last second, but he made contact with me," he said. "It hurt a little bit, honestly." What also wasn't fake was his body slamming to the mat over and over again. "The next couple weeks, my elbows and knees were scabbed up from falling so many times," he said. Crossed, who lives in Prince George's County and works as a bartender, is training for a bout later this month at the Walter E. Washington Convention Center. He said being knocked out by Tyson has gotten him lots of attention. "It's been awesome, man," he said. "People I haven't talked to in years have been calling my phone, texting me, saying they saw the commercial." Asked why he's called the Vanilla Gorilla, here's what he said, lifting his shirt: "'Cause I'm a hairy white guy, that's why." If Crossed and Tyson really competed, who would win? "I think I'd knock him out," Crossed said.